A nanny goat called Daisy has given birth to what are believed to be twin geep - goat/sheep hybrids - after a week-long dalliance with a Cheviot ram on a Co Mayo farm. Livestock experts believe the pair, owned by Angela Bermingham, may be the world's only surviving twin sheep/goat hybrids. The two geep have been nicknamed This and That by their owner, who is originally from Bury in Manchester. The ram, which is believed to have sired the pair, is owned by Padraic Holmes from Murneen in Claremorris. Ms Bermingham does not own a billy goat and says there are no roaming males around who could have mated with her Daisy. She says she knew there was "something going on" when Daisy, who is "a bit of gallivanter", jumped a fence outside her cottage into land owned by Mr Holmes where a flock of ewes and a ram were grazing. "I knew something was going on because she didn't come out of the field for a week", Ms Bermingham explained. "When she became obviously pregnant I knew immediately what had happened," she said. Hugging the two extremely agile little animals on one of the rare occasions she could get her hands on them, Ms Bermingham took a close up look and reckoned: "Well, they're not goats and they're not lambs either." "They were born with no horns and a full set of sharp teeth. That's not usual." She then pulled back one of the little geep's lips to reveal a formidable sawtooth arrangement of sharp incisors. 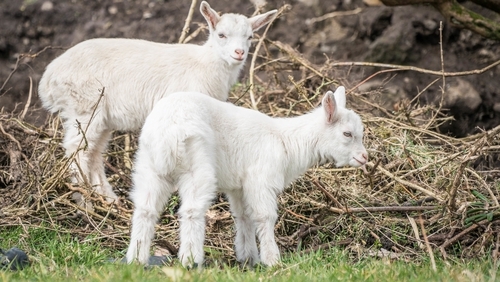 Michael Holmes, a member of Mayo County Council, expressed certainty that the curious looking little animals are the product of a relationship between Daisy the goat and his son's ram. Mr Holmes has authority on his side when he makes this assertion. A long-time livestock farmer, he is a former chairman of the Irish Farmers' Association's National Sheep Committee. "Angela's goat used to jump into the field where my son has the sheep and ram. These little geep are very unusual. I have never seen twins before and I have seen a lot of sheep all over Ireland and all over the world."